As title, I would like to use the IPv6 iPXE. 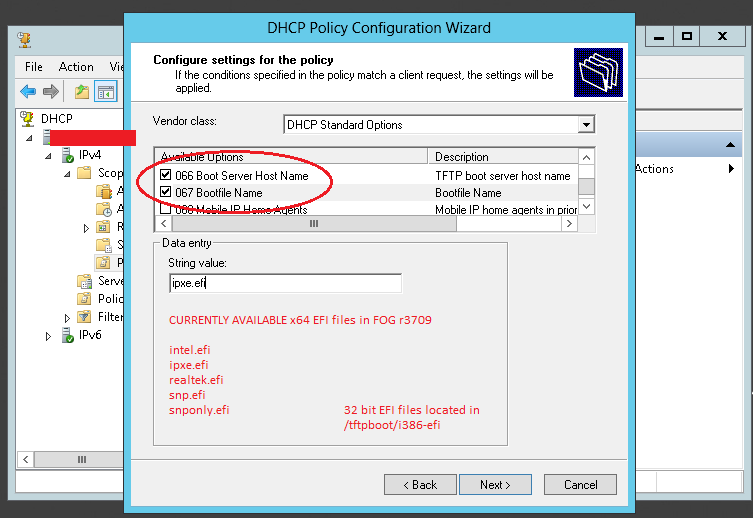 How can I use the DHCP IPv6 service under 2012r2 to "set the boot file" as same as IPv4? DHCPv6 uses a "boot URI" instead of a separate TFTP server IP address and filename. You should be able to just set this to any URI that iPXE understands. Thanks a lot, Michael. But could you please specify the steps in 2012r2? (2016-06-04 06:59)zerojay100 Wrote: Thanks a lot, Michael. But could you please specify the steps in 2012r2? It looks as though the bootfile URL (option 59) does not exist as a standard predefined option for DHCPv6 in Microsoft's DHCP server. I tried defining it via Microsoft's DHCP server UI. Unfortunately, the UI appears to be broken: it allows new DHCPv6 options to be added, but these options never show up in any lists. I can only suggest that you switch to using a less broken operating system for your DHCP server; sorry. After changed the DHCP service from windows server to linux ISC DHCP, it could boot ipxe with IPv6 (option 59), thanks a lot. Could you help to provide the DHCPv6 setting about option 59?